One of the rare chart patterns, the Cup and Handle Chart pattern or cup and saucer pattern is a very long term chart pattern can take a lot of time to form. This is a very reliable chart pattern and typically offers a very low risk compared to the rewards. The cup and handle pattern is formed when prices tend to bottom out, forming a gradual decline and then a smooth rally higher. It is this formation that gets the name of a cup. Upon reaching the previous support level, prices tend to break the support turned resistance only to fall back a small distance, forming a handle. The eventual break out from the handle, offers an immediate target to the resistance level and a measured distance of the bottom to the top of the cup formation, projected from the resistance level that is broken. 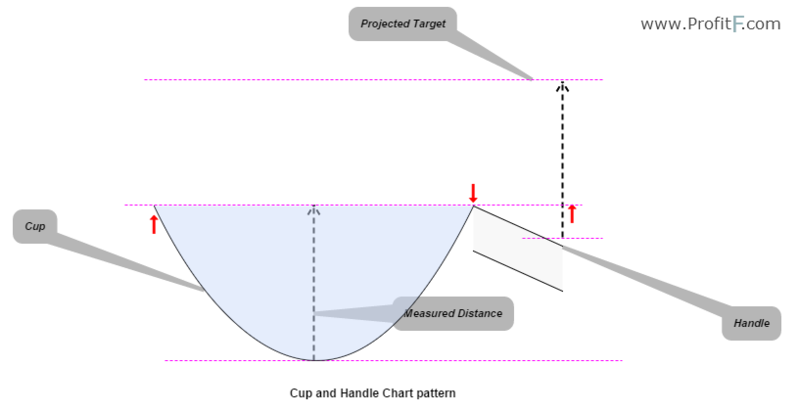 The chart below shows a typical “cup-and-handle” formation with the measured targets. The cup and handle pattern can be found in any time frame, however, it is advisable to only trade the cup and handle patterns on time frames of above H1 as these are more valid to trade. Figure 2 below, gives an example of the cup and handle chart formation on the EURCAD pair, daily time frame. Here, we can notice how price declined to form a bottom and start to rise gradually upwards. The main points of interest are the first support level that forms the left side of the cup which gave way for steep declines. On the rally back, this same level now acts as resistance and therefore prices react in the first attempt and drop back lower. After a minor decline, another attempt is made, this time being successful. As with the above example, the ideal point of entry to trade this pattern is the break out of the small handle or down sloping channel. If you look closely at the handle, it is nothing but a bullish flag pattern, which, as we know is a continuation pattern. Therefore, taking long positions on break out of this handle or flag pattern with stops below the most immediate dip before the rally could see a very low risk trade in regards to the high profit potential the cup and handle pattern can represent. The only problem with the cup and handle pattern is that does not appear that frequently and therefore, there may not be many trade opportunities coming your way. An alternative way to find out the cup and handle patterns is to first spot the bullish flag and immediate scan to the left of the chart. If you notice a rounding bottom price pattern, make use of the drawing tools to see if the cup and handle formation can be validated and then identify the support level. In some cup and handle formations, prices when consolidating near the handle can decline a bit steeper. Therefore, it is essential to not hurry into a trade, but to wait for a successful break out and possibly a retest of the handle’s break out. When the handle’s decline is steep, always make sure to target the support/resistance level of the cup and make it your first target followed by the eventual target which is the measured height of the cup, projected after the resistance is broken. In conclusion, the cup and handle chart pattern is simple and easy to trade. 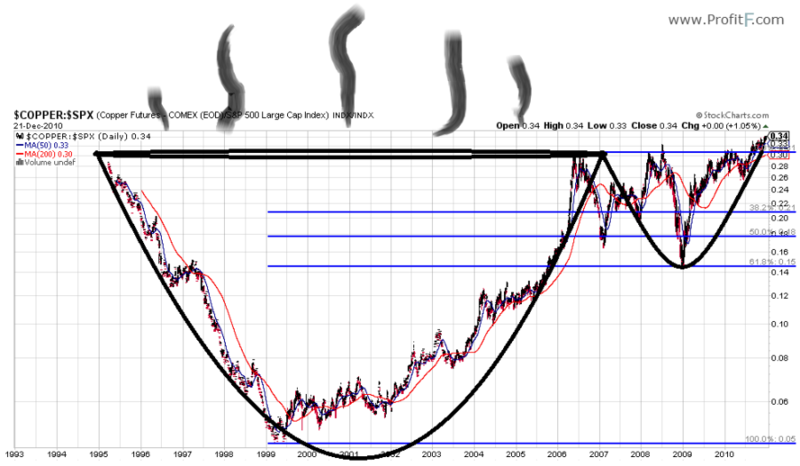 With due practice, traders can train their eye to spot the cup and handle formations. The biggest advantage of trading this chart pattern is the very small risk to the high rewards that this pattern has to offer. this pattern always giving me a green pips. The powerfulness of this pattern is (Trade with the trend, i mean continuous pattern).